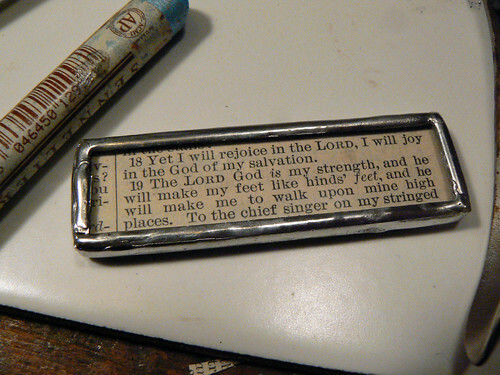 Working on more Scripture pendants and hymnal rings. The shop should be full by next Wednesday, in plenty of time to still use the coupon code, ACHOO, for 15% off through the end of November. That always feels weird saying. Promotion, marketing. I love what I make. I just hope you do too, even if you don’t purchase. My hope is always to inspire the mind to creative motion. 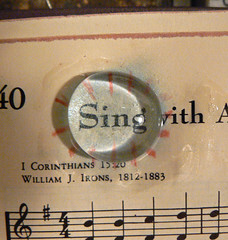 Lately I’ve been inspired by my ancient, falling-to-pieces Bible, and my childhood hymnal. At some point I will have expired the Bible I’m deconstructing. I know some will be offended that I use an actual Bible for the jewelry, but the other choice is the fire for this book. Its earthly days are done. I am praying that another well-worn, falling-to-pieces, thick-paged Bible will fall into my hands. I love to take beauty that would otherwise be discarded and incorporate it into daily use. On another note, I am having a great time with the Art Every Day Month challenge. Not only I am pushing myself to actually meet my goal of daily studio time, I find such enjoyment from viewing the other AEDM participants. One of my favorites has been Tracy Fletcher King. Love her art and her banter. Go have a look-see. Your soldering skills are so much better than mine! Whoha! I am going to be shopping BIG TIME! my step daughter will love this for Christmas….xxxxoooo and my SIS for her bday, and my dear friend in Oregon and perhaps my young nieces and Oh! A perfect one for Trish as well…! 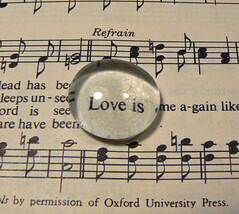 Mmmmm…..
Oh, I so want the “love is” one. I love your work, my friend. I do love these Bible Verse Pendants! They have a nostalgic and classy look. I used to do a lot of paper & mixed media art… but that was all before I started blogging. 😉 On that note… thanks for ‘listing’ me on Twitter.